I think about fitness a lot. Normally it’s while I’m eating ice cream or finishing off a pack of cookies. Normally my thoughts are that I need to eat less ice cream and cookies and workout more. 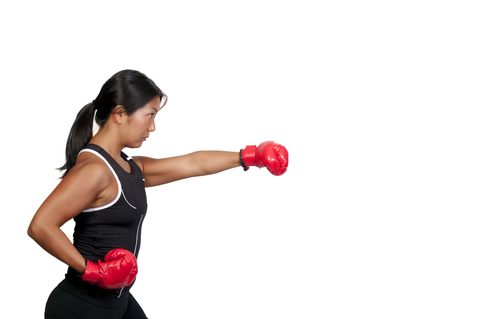 When a friend invited me to try a boxing class with her, I thought it would be a fun (and beneficial) thing to do. The class is called Jess Boxing, and as I would come to find out, it has been going on in Luxembourg for the last 9 years. Started by Jess Lampeitl, who has since moved to Sweden, the class is now run by Marie Barton a former trainee. The most experience I’ve had with boxing was doing a Tae Bo video with my friends in high school and a kick boxing class in a gym, once, when I was in college. So basically not a lot. Finding the class made me feel like I was already accomplishing something as it’s tucked away in a school gym in Clausen. I managed to find the class by following a woman in workout clothes. When I arrived people introduced themselves and there was a sense of camaraderie. Everyone was talking about a juice cleanse they were going to try. She started the music and everyone began to warm up. We were running, doing star jumps and shuffling from side to side. By the end I was warmed up and thought I was doing pretty well. Then we partnered up and began doing a series of punches. One person would use gloves to punch and the other would hold the pads. I really enjoyed this part. Learning the correct form for punching was great. I could tell that doing this type of training would lead to a stronger core and overall fitness. Then we got into a circle. Up until this point, I thought I had done well but then we began a series of squats, planks and pushups. As I was doing my second set of squats, I noticed that I had caught Marie’s eye. She was looking at me with vague amusement (or disgust) and shouted, “Are you okay? Your legs look really shaky.” I was surprised to hear this, as I thought I was killing the squats. From that point forward I felt pretty self-conscious. We partnered up again and I punched until my arms felt like noodles but felt much more aware of being watched. Fortunately somebody got a leg cramp, so the pressure was off. After that it was time for our cool-down and then to sneak out. Marie recommended that I do the beginner program if I wanted to continue (all that Tae Bo was for nothing!). She said that I needed to get the forms down but I think she was remembering my “shaky legs”. I went home feeling really energized. The next day came and I was nicely sore all over. I could really feel all the work in my legs after the lunges, particularly when I went up and down stairs. This class is definitely for people who are serious about working-out. It’s not a fun day out to the gym with the girls. It’s a real training class. I feel like if I did it for a month, I would have a six-pack. The website has all the course information and, like most fitness programs, promises to help you lose weight and tone up. Unlike most programs – I think this one is true!